Department of Photonic, Institute of Science and High Technology and Environmental Sciences, Graduate University of Advanced Technology, Kerman,Iran. Dosulepin and doxepin are tricyclic antidepressants. The molecular geometries, harmonic vibrational frequencies, quantum chemical parameters and thermodynamic properties of dosulepin and doxepin were calculated by Generalized Gradient Approximation methods developed by Perdew and Wang (GGA-PW91) and Becke-Lee-Yang-Parr (GGA-BLYP) in the gas phase and solution media. The local reactivity of these drugs was studied by the Fukui indices in order to predict both the reactive centers and the possible sites of nucleophilic and electrophilic attacks. Computational and chemical simulations were carried out for these drugs. 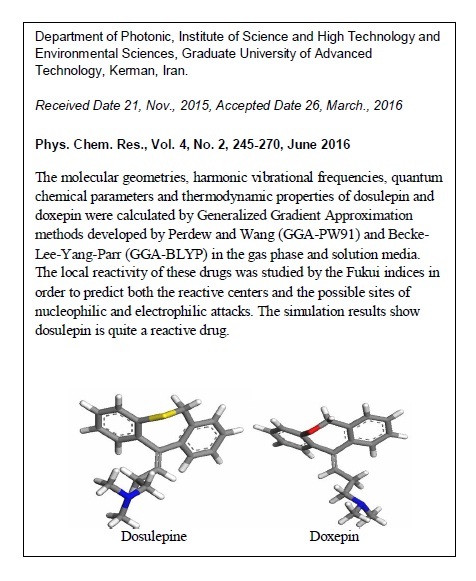 Quantum chemical parameters of dosulepin and doxepin were calculated and compared. The simulation results show that dosulepin is quite a reactive drug. The fundamental modes of the vibrational frequencies were determined for dosulepin and doxepin. The BLYP/PW91 analyses of the wavenumbers show that the frequencies assigned to doxepin are higher than those assigned to dosulepin in the gas phase and solution media.